The White Wagtail on the picture was ringed at Lista Bird Observatory in may 2016 and photographed in Poland four months later. The White Wagtail is one of our most famous small, long-tailed and rather sprightly bird. It is easy to see it close to where people live, standing and frantically wagging its tail up and down or looking for food on the grass. 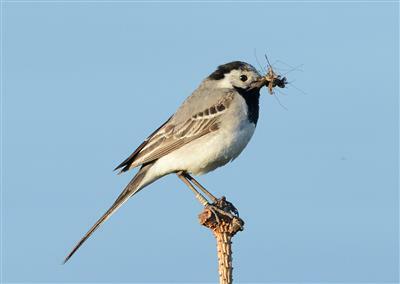 The first White Wagtails come in early spring, when most of the birds arrive from the winter quarters near the banks of the Nile river in Egypt and surroundings. This species is common around the lighthouse, where it finds food in the short grazing grass or in the saeweed along the shore. The nest is often placed on rock walls, barns or under the stones. We can often see here some dark White Wagtails that are unusual in the rest of Norway. These birds belong to the subspecies "yarrellii" that usually breeds on the British Isles, known as Pied Wagtail. Here, both subspecies often breed in mixed pairs. Lista Bird Observatory has been part of a national color ringing project for White Wagtail since 2013. The project is leaded by the Sunnmøre Ringing Group, and the goal is to learn more about its migration routes and wintering areas. The color ringing is carried out at the same time as the standardized ringing, and provides multiple readings that give us better knowledge of the local breeding behaviour on the breeding areas around the observatory and during migration.